‘Clean Air in London’ (CAL) welcomes the hard-hitting report from Parliament’s powerful Environmental Audit Committee (EAC) titled ‘Air quality: A follow up report’. The EAC undertook the inquiry to assess the extent to which the Government had implemented the processes outlined in its November 2010 response to the EAC’s report on air quality in March 2010 and to assess their results. “No Parliamentary Select Committee can ever have published a more damning report of a Government’s failure to protect its people from harm. Further, CAL has found hard evidence the Government has not considered the glaring socio-economic impacts of this invisible public health crisis. “The Environmental Audit Committee (EAC) rightly says 4,000 people died as a result of the Great Smog of London in 1952 and 4,000 died in London, the Olympic City, in 2008 from air pollution. Only smoking causes more early deaths. Alcoholism and obesity trail far behind. “Air pollution has reduced since the 1950s so there are fewer deaths now due to short-term exposure to it. However, since the mid-1990s and more recently scientists have discovered that the health impacts due to long-term exposure to air pollution dwarf those due to short-term exposure. As a result, we know there are more early deaths now in London due to air pollution than we thought occurred in the Great Smog of 1952. We now also have the first causal links between traffic-related air pollution and asthma that may account for up to 30% of all new cases of asthma in children. “Preliminary results for England indicate that poor air quality is associated with areas of low income, low employment and lower education attainment, with differences in exposure to air pollution between different ethnic groups. CAL which saw these results, from work done by Imperial College’s highly respected Small Area Health Statistics Unit (SASHU), presented at the International Society for Environmental Epidemiology (ISEE) conference in Barcelona on 16 September 2011 recollects that the worst effected groups were exposed to up to 50% more NO2 than those least effected i.e. the health inequalities linked to combustion related air pollutants are up to twice those for PM10. The research presented in Barcelona was titled “Associations between small area levels of air pollution and socio-economic characteristics in the Netherlands and England”. CAL hopes the SAHSU will publish its results shortly and/or release copies of the slides presented at the public conference in Barcelona. “CAL wrote to the Defra Secretary of State on 2 August 2011 requesting details inter alia of any Racial Equality Impact Assessment undertaken by Defra for NO2. Defra replied on 31 August confirming that an ‘integrated’ impact assessment and racial equality impact assessment had not been carried out and that it held no ‘documentation’ with respect to CAL’s request. CAL wrote to Defra again on 11 October having attended the ISEE conference in Barcelona in the intervening period expressing grave concerns regarding omissions in the consultation. After a further unsatisfactory response, CAL has instructed its solicitors, Harrison Grant, to investigate Defra’s failure to ‘hold any information on a race equality impact assessment for NO2’ and related matters. It is very odd that no such study has been undertaken for NO2 not least given that one was undertaken for PM10 in August 2009.
is trying to create a legal loophole – where none exists – by submitting a so-called ‘short-term plan’ to comply with NO2 limit values in London, that would miss by up to 15 years the legal deadline that has been in legislation since 1999, instead of applying for a time extension (which could only be granted subject to strict conditions including ensuring compliance with the limit value plus margin of tolerance). “CAL supports wholeheartedly the EAC’s recommendations which include setting up a Cabinet Office lead Ministerial Group to oversee delivery of a new cross government air quality strategy. Only the Prime Minister and the Deputy Prime Minister have the authority to respond to and accept the EAC’s report and recommendations. They must do so urgently. 1. A Ministry of Health report estimated that 4,075 more people died during the Great Smog of 1952 than would have been expected to under normal circumstances. These people died due to short- term exposure to air pollution. 2. We did not know about the health impact of long-term exposure to fine particles (PM2.5) until ground breaking research was published in the United States in the mid-late 1990s and more recently. These studies showed, with as much certainty as those for smoking, that the health impacts of long-term exposure to air pollution dwarf those for short-term exposure. So while air pollution has reduced and become less visible, it is causing as many early deaths as we thought occurred in the Great Smog of 1952. What will we find in 60 years’ time – air pollution causes genetic changes? 3. Using the same language used for alcoholism, obesity and smoking, the best estimate, from the Mayor of London, is that 4,267 deaths in London in 2008 were attributable to long-term exposure to anthropogenic and non-anthropogenic PM2.5 at an average loss of life for these people of 11.5 years. 4. The 4,267 estimate is calculated after eliminating the effects of dozens of other risk factors (e.g. educational status as a substitute for income and smoking) to produce a pure number assuming air pollution is the sole cause of those deaths. 5. The estimate of 4,267 extra or excess deaths is a good one for comparing with the effects of other possible causes such as alcohol, active or passive smoking, obesity, diet etc. which are calculated in the same way. However, in practice, because individuals experience multiple risks, including air pollution, almost certainly air pollution played some part in shortening the life of a much larger number of individuals in London. It is not possible to estimate the number reliably but given that much of the impact of air pollution is linked to cardiovascular deaths, it is more reasonable to consider that air pollution may have contributed to all 15,800 cardiovascular deaths in London [in 2009] (i.e. one in three of all deaths) at an average additional loss of life for these people of some three years (at typical ages for cardiovascular deaths e.g. 15% of which are before the age of 65). 6. Separate scientific research published recently by the Aphekom group of scientists has shown that those living near roads travelled by 10,000 or more vehicles per day on average could be responsible for some 15-30 per cent of all new cases of asthma in children; and of COPD (chronic obstructive pulmonary disease) and CHD (coronary heart disease) in adults 65 years of age and older. The same study further estimated that, on average for all 10 cities studied, 15-30 per cent of exacerbations of asthma in children, acute worsening of COPD and acute CHD problems are attributable to air pollution. This burden is substantially larger than previous estimates of exacerbations of chronic diseases, since it has been ignored so far that air pollution may cause the underlying disease as well. Related research indicates that associations of asthma with traffic-related pollution from nearby sources at schools were independent of estimated effects of exposures at homes. After a Freedom of Information request to Transport for London, CAL found 1,148 schools in London within 150 metres of roads carrying over 10,000 vehicles per day and a total of 2,270 within 400 metres of such roads. 7. Preliminary results for England indicate that poor air quality is associated with areas of low income, low employment and lower education attainment, with differences in exposure to air pollution between different ethnic groups. CAL which saw these results, from work done by Imperial College’s Small Area Health Statistics Unit, presented at the International Society for Environmental Epidemiology conference in Barcelona on 16 September 2011 recollects that the worst effected groups were exposed to up to 50% more NO2 than those least effected i.e. the health inequalities linked to combustion related air pollutants are up to twice those for PM10. The research presented in Barcelona was titled “Associations between small area levels of air pollution and socio-economic characteristics in the Netherlands and England”. 8. Defra undertook a Racial Equality Impact Assessment in 2009 for the UK notification to the European Commission to extend the compliance deadline for meeting PM10 limit values in ambient air to 2011. It is attached to this article. It is very odd that no such study has been undertaken for NO2. 9. There are two main types of pollutants in ambient air: particles and gases. The dangerous airborne particles (e.g. soot and tyre and brake wear) are measured as PM2.5 and PM10 and the main gas measured is NO2 (nitrogen dioxide). 10. PM10 limit values have been in legislation since 1999 to be complied with by 1 January 2005. On 11 March 2011, the European Commission granted the UK a ‘temporary and conditional exemption’ until 11 June 2011 to comply with the PM10 daily limit value in London. This required the UK to amend its air quality plan for London and submit it to the European Commission by 30 November 2011. A plan was submitted to the European Commission in June who allowed a time extension until 11 June 2011. However, the UK had failed to consult on the amended air quality plan and after a legal challenge from ClientEarth, launched a consultation on it on 13 October 2011 which closes on 6 January 2012. The UK therefore unlawfully submitted its amended plan to the European Commission and obtained a time extension. 11. NO2 limit values have been in legislation since 1999 to be complied with by 1 January 2010. Member States may apply for a time extension until 1 January 2015 subject to strict conditions including the need to demonstrate compliance by the new date. The UK carried out a consultation between 9 June and 5 August 2011 on its draft time extension request(s) and plans and programmes. These showed three zones only of 43 UK zones complying with the NO2 limit values by the due date of 2010, with 23 more perhaps by 2015, 16 by 2020 and London by 2025. The UK submitted these to the European Commission on 23 September 2011. 13. By January 2010 and January 2011, London had breached for the whole year the NO2 hourly limit value at the main London monitoring site at Marylebone Road. The NO2 annual mean limit value is breached by more than a factor of two near London’s busiest streets. 14. 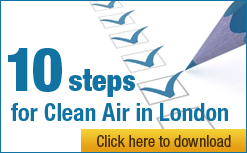 On 12 October 2011 the UK submitted its final air quality assessment report for 2010 to the European Commission. An analysis for CAL indicates there were unlawful levels of NO2 in up to 75 marginal Parliamentary constituencies in 2010. See attached table. 15. CAL wrote to the Defra Secretary of State on 2 August 2011 requesting details inter alia of any Racial Equality Impact Assessment undertaken by Defra for NO2. Defra replied on 31 August confirming that an ‘integrated’ impact assessment and racial equality impact assessment had not been carried out and that it held no ‘documentation’ with respect to CAL’s request. CAL wrote to Defra again on 11 October having attended the ISEE conference in Barcelona in the intervening period expressing grave concerns regarding omissions in the consultation. Defra replied on 27 October dismissing CAL’s concerns. Those letters are attached. CAL has instructed its solicitors, Harrison Grant, to investigate Defra’s failure to ‘hold any information on a race equality impact assessment for NO2’ and related matters.